Just Jingle: Pretty Flowers Make Me Smile....and Sneeze. Just say'n. Pretty Flowers Make Me Smile....and Sneeze. Just say'n. Well, since the weather has taken this beautiful turn it seems that plants are responding quite quickly! We have three forsythia bushes one one side of our carport. They were just twigs as of Tuesday night. Last night, upon arriving home after a dinner out with friends, I saw that two of the three had decided it was time to bloom and suddenly had all kinds of flowers on them! Totally fast and totally random! I also noticed several lovely pink trees throughout the city that have popped into bloom! It's really quite wonderful! Except that I'm allergic to most of the stuff that comes alive this time of year, but so far, so good. I'm okay with that. HA! The card I have to share with you today has pretty flowers just JUMPING off of it! ACK! So fun! I created this card using the Scrapbook Circle Best. Day. Ever. kit! O.M.G. This kit was so much fun! I was actually surprised, as I wasn't sure about it at first, but once I got my hands on it I LOVED the projects that came out of it! AND...this one came from a fun sketch over at Scrapbook Circle! You still have time to participate in the Sketch Challenge if you would like! 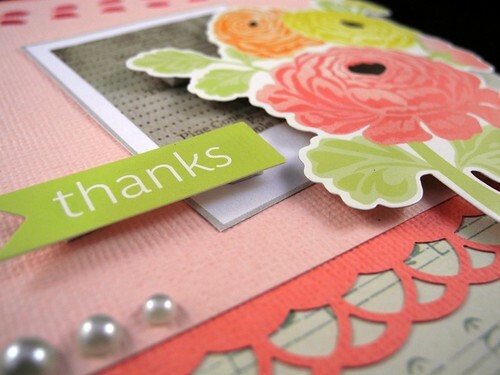 Complete a card by 3/30 and email it to Diana and your card will be featured on the Scrapbook Circle blog! Check it all out here! Now I have a question for you guys. Would you prefer I give instructions for my cards here in each post or do you just use them as inspiration to do your own thing? Or...do you not need instructions because really you just keep coming back to see the train wreck? HA!!! I kid, I kid! But, really....would you like to have card instructions? Would that be a useful feature for you? What else would you like to see here on my blog? Really. I'd love to have your opinions! Thanks! Beautiful card! Dear Lizzy is such a pretty line. I don't scrap girly stuff much but had to have it anyway! 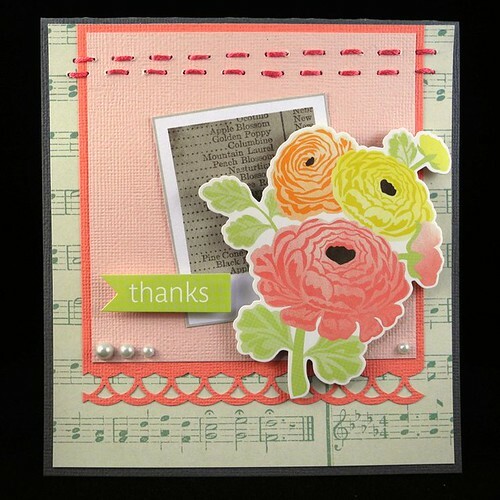 Beautiful card - love the border! your card is wonderful...I love how you did the stitching at the top....to answer your question...I personally do not read step by step instructions...Hope that helps in making your decision. They make me sneeze too! Jingle-love the card and the stitching looks beautiful. Fabulouse work!!! I would love for you to share some of your stamping techniques here and there! What a pretty card Jingle! But I must say, there's nothing that you've done that I don't like! As for reading instructions on your cards. I really haven't read them. I've been out of card making mode for a while now but still enjoy seeing what other people do - the colors they put together, the layout, etc. My lilacs are budding out. And we were still getting snow earlier in the week! I just hope we don't get a hard frost. Love the stitching and flowers. I only like technique tutorials of something new and fun out in the crafty world. Gorgeous...just love all the details and the colors! i like how you say what products you use and where you get them as i have to shop online due to being in a small town. I'm more curious about finished products - I love to look at pictures! Loved your card by the way - it's beautiful. You could write the most detailed instructions EVER but I am a paper-phob so I would not GET it. LOL! I just love seeing YOUR beautiful, fun creations! You are THE QUEEN of cards, lil' Jingle-girly! (P.S. I am NOT a fan of Spring, but I do love the darling woodies (Woodpeckers) whose little red topnotches make me HAPPY! They are EVERYWHERE at this time of year. Also love that we have fresh, almost fully grown sugar snap peas in abundance, as well as big, yummy radishes. As for all the trees - one word: ACHOOOOO! I love this card, Jen! I really just use cards as a jumping off point but I do like when you use a specific technique that you give a mini tutorial like when you made the hand sculpture. Gorgeous card, Jennifer! I LOVE those peonies and the stitching is fabulous. Do you use a Sew Easy? Love the stitching, and the gorgeous peony accent, and the musical background...awesomeness! I like how you explain already--as in, I used watercolor pencils and crayons here...or I used the tv shadow box from here and used stickles for the test pattern. That's enough info for me! Super pretty card! Sometimes the fun of the game is to figure out how you did something, so I would say that instructions aren't needed!